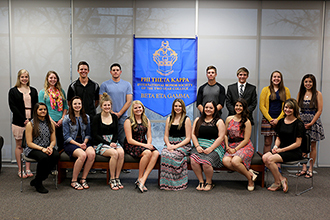 Lamar Community College's Beta Eta Gamma chapter of the Phi Theta Kappa Honor Society welcomed its newest members during the spring induction ceremony on March 29, 2016. (Wiley), Shayla Claybrook (Wiley), Emma Davis (Vancouver, Washington), Alex DeBell (Lakewood), Paige Dempsey (Wiley), Shelby Henderson (Lamar), Julianna Hernandez (Lamar), Kylee Holden (Granada), Robert Holden (Granada), Jaime Huerta (Granada), Sami Johnson (Monte Vista), Edina Krusko (Littleton), Andreya Martinson (Granada), Micah Middleton (Lamar), Miranda Morgan (Wiley), Felicia Null (Englewood), Ayushi Patel (Lamar), Emily Ramsay (Lamar), Blake Ridgeway (Wiley), Chyann Sewell (Eads), Jack Stamper (Monument), Emma Westhoff (Lamar), Matthew Whittley (Coolidge, Kansas), Megan Wurst (Lamar), and Karina Vazquez (Lamar). After a welcome from LCC President John Marrin, the guest speaker for the ceremony was LCC instructor Jim Farmer. Mr. Farmer has taught a variety of courses at LCC for several years, including Journalism, Public Speaking, and Marketing, among others. He engaged the audience with lively examples of his own educational and professional experiences, and encouraged the new members of Phi Theta Kappa to make the decision to try new things in their own lives and take advantage of any opportunity that comes their way. Phi Theta Kappa is an international scholastic honor society with a two-fold mission: to recognize and encourage the academic achievement of two-year college students and to provide opportunities for individual growth and development through participation in honors, leadership, service and fellowship programming. Founded in 1910, it is the oldest and largest academic honor society of its kind. The Beta Eta Gamma chapter of Phi Theta Kappa promotes and honors academic excellence at LCC and is active on campus. LCC's Phi Theta Kappa officers are Carly Feuerstein, Beecher Strube, Taryn Frazier, Kristin Arns, Malea Orozco, and Marie Mohler.